The two-week slots tournament beginning Monday at Intertops Poker and Juicy Stakes Casino will feature three ghoulish games from Betsoft. Last month the casinos increased the prize pool for their monthly slots tournament and they’re once again putting up $2000 in prizes for the top 16 players. 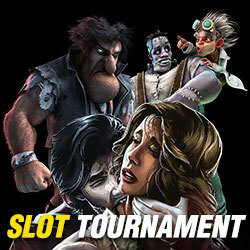 The casinos have chosen three frighteningly fun slot games for their Halloween slots tournament: Blood Eternal, Dr. Jekyll & Mr. Hyde, and Frankenslot’s Monster. Blood Eternal is a six-reel a vampire-themed game, loosely based on the Twilight movie series, with Vampire Free Spins and a Double Bats features. Dr. Jekyll & Mr. Hyde re-tells the classic tale of a doctor hiding a monstrous side of himself. This game has four special features including a Logo symbol and Frenzy bonus game. In Frankenslot’s Monster, Dr. Frankenslot has finally built a terrifying creature that players control during a thrilling bonus round. Scatters can trigger 8 free spins and during free spins there up to three electrified Wilds. Known around the world for their busy poker rooms on the Horizon Poker Network, Intertops Poker and Juicy Stakes Casino also offer slots and table games from Betsoft, Lucktap and Worldmatch.